Magnan public beach is a true city beach with easy access to public transport, a first aid station and plenty of snacking and dining opportunities. Plus, it's an easy walk from central Nice. The beach is wide and long, making it a favorite of a populous neighborhood. 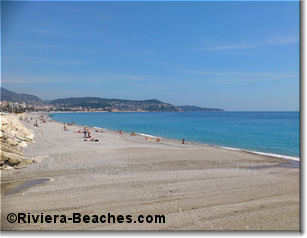 As the beach is separated from the Promenade des Anglais by high rocks, it's quieter than many other Nice beaches. The only negative point is that the beach and neighborhood are named after the Magnan, a small coastal river that empties into the sea in the middle of Magnan beach. Normally the river runs dry but with a storm the river can rush into the sea with a variety of pollutants. It's not a good idea to swim at this beach right after a storm. Move one beach over east to Poincare or west to Lenval, depending on where the wind and current is carrying the river water. From June to September there's a lifeguard on duty and a complete first-aid station. See more about lifeguards. There's very limited hourly parking on the Promenade des Anglais but it's wise to avoid the parking hassle and come by foot, bike or bus. Besides a portable WC in the summer there are no other facilities. The Magnan/Promenade bus stop is on the Promenade at the main beach entrance. You'll find buses 8, 11, 52, 59, 60, 70, 94, 98, 200, 230, 400, 500. See more on buses in Nice. Walk up ave de Bellet from the main beach entrance and there's Cafe Magnan, a large brasserie-style cafe with good food. Next to it is a pizza/sandwich place. Walk a little further and there's a Carrefour supermarket on the left. 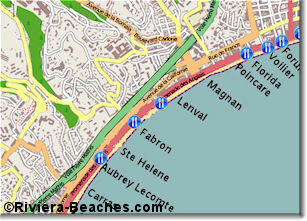 Otherwise walk west a little to Bambou Plage beach restaurant or east 10 minutes to Florida Plage beach restaurant. The Adagio Access is a tidy two-star hotel near Magnan beach at the ave de la Californie.